i’ve written before about the enjoyment i get from reading rowley leigh’s recipes in the ft magazine and this dish, made with the second lobster that i bought for xmas, is based on his recipe for crab spaghetti with chilli and mint. crab linguine is something i make regularly – tinned white crabmeat is good enough that this is a store cupboard standby, for days when i want something quick and easy or for when i have very little else in. my usual version has fiery flavours – lemon juice and zest, raw chilli (and sometimes garlic) plus parsley and a healthy dose of olive oil. rowley leigh’s recipe takes a different approach – butter is used in the place of olive oil, the chillies are charred over a flame to soften their flavour, there is no garlic, the lemon juice is added in small quantities and it’s mint rather than parsley. i decided to try this approach with my second lobster. charred, skinned and chopped red chilli was fried in a little butter and then removed from the heat, with the lobster meat added so it heated through from the latent heat in the pan. when the pasta was ready i added it to the lobster and chilli with a little extra butter, some pasta water plus a small amount of lemon juice and finely chopped mint. the flavours are subtle but decadent – the butter makes this a rich dish, but is balanced with the lemon juice; the chilli and mint add subtle layers of aromatic flavour. it’s an elegant dish and you can see why it is a popular dish in rowley’s restaurant. i’ll be trying with crab in due course. burn the chillies on an open flame to blister their skins and seal them in a plastic bag for 15 minutes. then peel off the burnt skins before cutting them open and scraping out the seeds. chop the remaining pulp finely. bring a large pot of water to the boil with a tablespoon of salt. add the spaghetti and bring back to the boil. while it cooks, melt half the butter in a large saucepan or wok and add half the chilli pulp. add the white crabmeat and then remove from the heat. once the spaghetti is al dente – around eight minutes, trust the packet’s instructions – lift it on to the white crabmeat and return to a high heat. 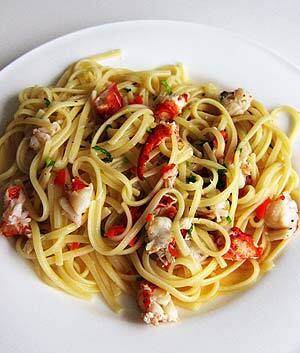 turn the crabmeat in the spaghetti, then add the brown meat, remaining butter and the coarsely chopped mint. turn this together well, adding a ladleful or two of the spaghetti’s cooking water to lubricate, then taste. it will probably need more salt, more chilli and certainly some lemon juice to heighten the flavour. serve as soon as you are happy with the result.